It is so important to me that my kids are exposed to and learn about diversity and other cultures. That is why I am super excited to be participating in this year’s #ReadYourWorld Multicultural Book Day, which is on Friday, January 27. You can learn more about Multicultural Book Day at the end of this post. Disclosure: Andrea Wang sent us a free copy of The Nian Monster, but all opinions are my own. For your convenience, this post also contains affiliate links. The Nian Monster is a retelling of a Chinese New Year folktale set in modern-day Shanghai. In a fun and kid-friendly story (even scaredy-cat kids! ), it gives a quick background of the Nian Monster and some of the reasoning behind certain decorations used for Chinese New Year celebrations. It follows a clever little girl around popular landmarks of Shanghai as she outsmarts the Nian Monster. The story seamlessly ties in Chinese New Year customs, like traditional foods that are eaten during the celebration. 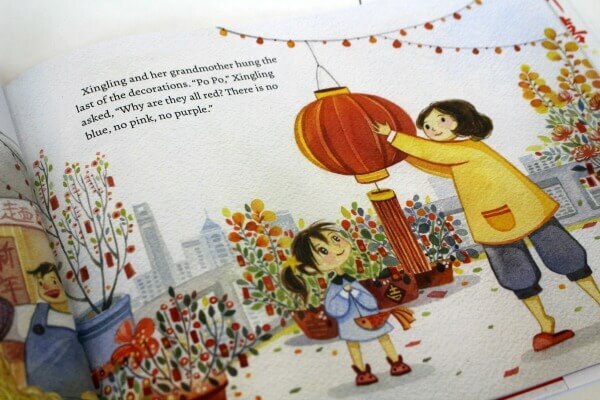 At the end of the book, a one-page Author’s Note includes even more in-depth details about events from the book, Chinese New Year traditions, and Chinese culture. This year, Chinese New Year is on January 28. So there is still time to order a copy of The Nian Monster with Amazon Prime 2-day shipping. Even if you don’t get it in time, it is still a great book to read any time of the year to teach diversity and other cultures to your children. The color red is one of the Nian Monster’s weakness and it scares him away. Red lanterns are a traditional decoration used during Chinese New Year celebrations. The number 8 is the luckiest number in Chinese culture. 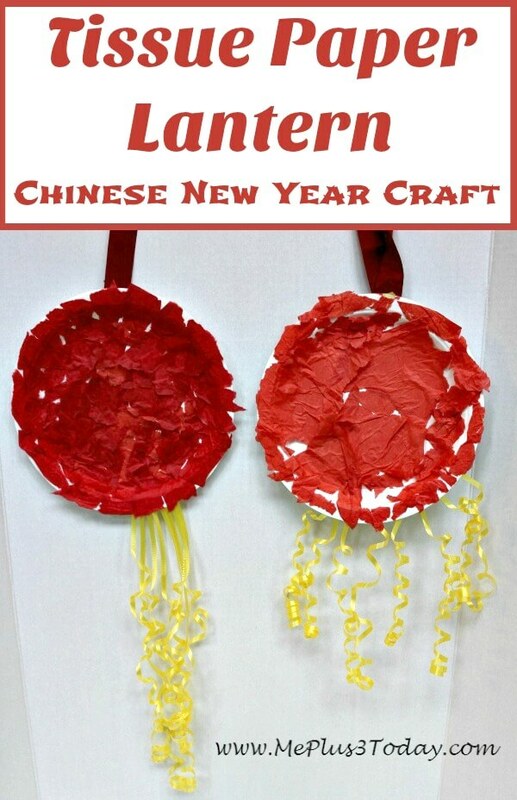 We reinforced this new knowledge of traditions and customs from China with a fun Chinese New Year craft that is perfect for preschoolers, a Tissue Paper Lantern. I explained to the kids that we were going to make a craft that resembled the lantern being hung at the beginning of the book. 1. 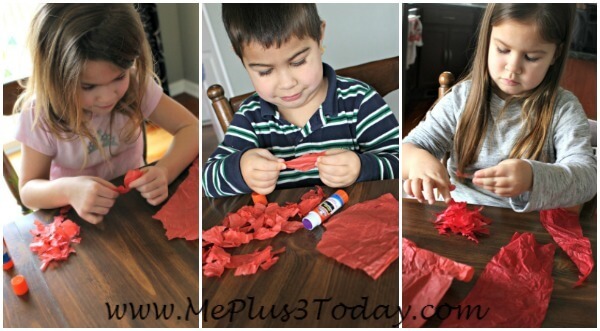 First, the kids ripped up sheets of red tissue paper into smaller pieces. 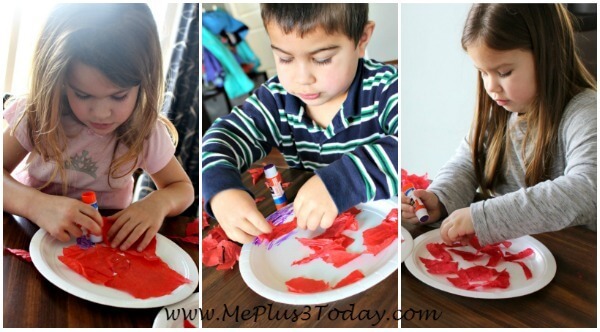 I thought this would be a good way to help with fine motor development. I told them to tear them into pieces as small as they wanted. They started out pretty small, but became bigger towards the end of the ripping process. 2. 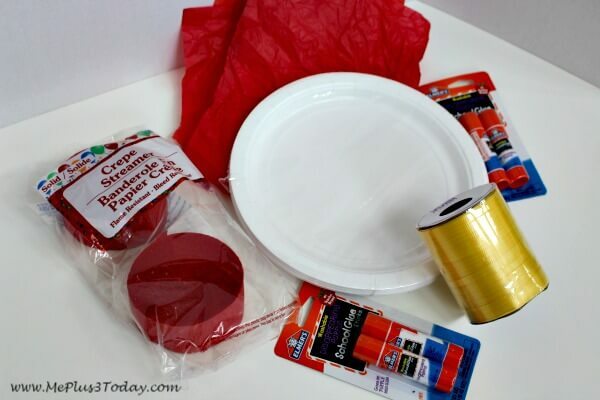 Next, the kids glued the ripped up pieces of tissue paper onto the white paper plate using a glue stick. I told them to try and cover up as much of the white plate as possible because we wanted it to look like the lantern from the book and a lot of red would scare away the Nian Monster. 3. I cut out and curled the curling ribbon while the kids were ripping and gluing. Each kid got 8 pieces of ribbon to symbolize that 8 is luckiest number in Chinese culture. 4. Then the kids glued the yellow ribbon on the back of the plate so that it would hang from the bottom of their lantern. It was my vision that it would look similar to the tassel on the lantern shown in the book, however they glued it on differently, which is fine. 5. We glued a red ribbon, which I had leftover from Christmas wrapping, to the top for hanging. 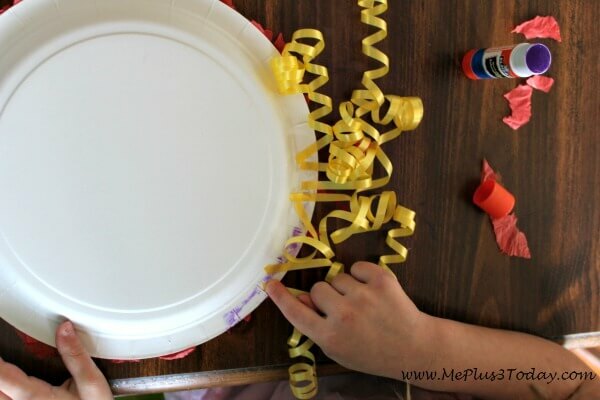 When you do the craft, you can use the yellow curling ribbon. And there you have it! 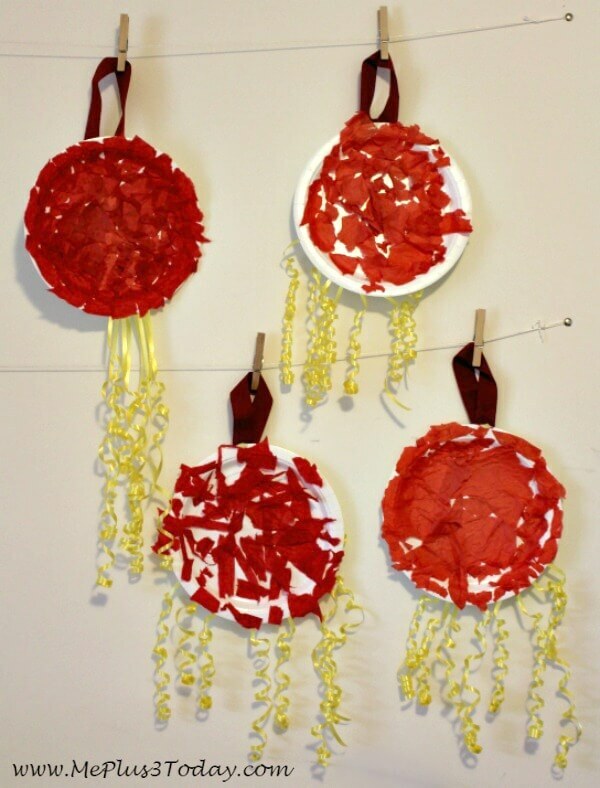 Our completed Tissue Paper Lanterns for a Chinese New Year craft! I made one too to illustrate what my vision was for the craft. Of course, each kid’s lantern turned out a little different from each other, which was another great way to show the kids how differences and diversity are a wonderful thing. 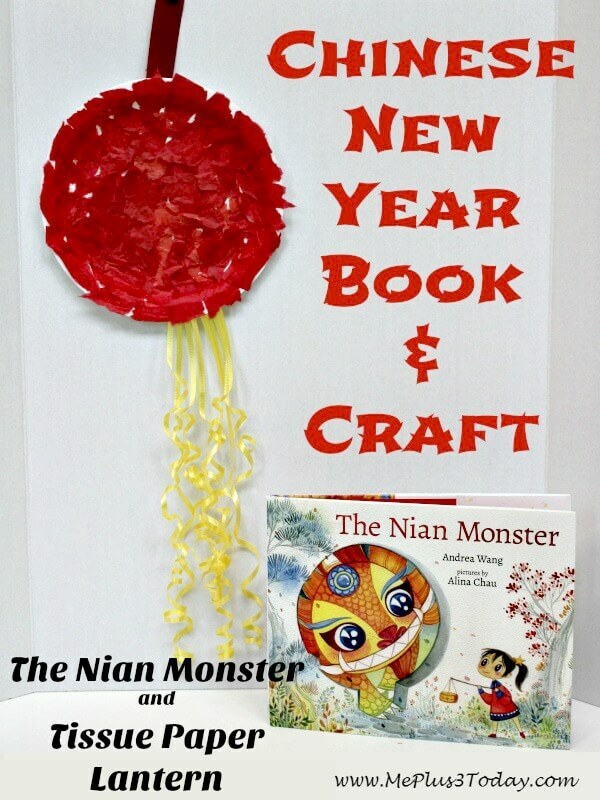 I hope that you decide to share other cultures and traditions with your kids, including The Nian Monster and this tissue paper lantern Chinese New Year craft! Andrea Wang grew up making dumplings and taking baths with orange peels to prepare for Chinese New Year. She loves to travel and try new foods and has tasted camel in Beijing, mantis shrimp in Hanoi, and emu in Perth. 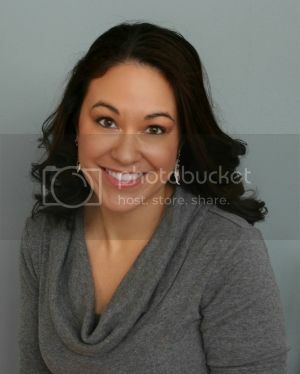 The Nian Monster was her debut picture book, and she has also written seven nonfiction books for the educational market. A former environmental scientist and a longtime resident of Massachusetts, Andrea now lives in Colorado with her family and their dog, Mochi, named for the sticky rice dessert. Visit her at www.andreaywang.com. Multicultural Children’s Book Day 2017 (1/27/17) is in its fourth year and was founded by Valarie Budayr from Jump Into A Book and Mia Wenjen from PragmaticMom. Our mission is to raise awareness of the ongoing need to include kid’s books that celebrate diversity in home and school bookshelves while also working diligently to get more of these types of books into the hands of young readers, parents and educators. 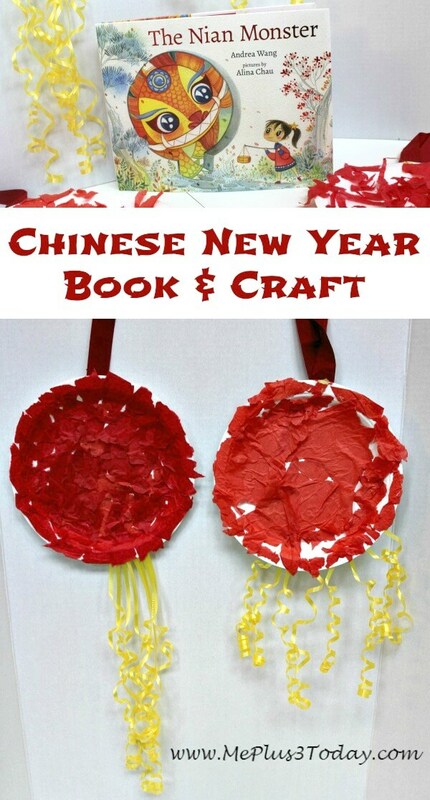 Tagged Chinese New Year, Craft Ideas, Daycare, Holidays, Preschoolers. Bookmark the permalink.